I am a first year engineering student and thus studying turbo C++ and sometimes I work with Graphics.To work with graphics, we need a full screen mode. Turbo C++ support full screen mode easily in windows xp but I have bought new windows 7 Laptop but here Turbo C++ opens only in half screen mode and thus I am not able to use Graphics. Is there any way to use Graphics programming in windows 7 using Turbo C++? Why Windows 8 doesnÂ’t allow the apps to work in resize window rather to be always in full-screen? To use Turbo C++ IDE in windows 7 and to use graphics install*your *"Graphics driver "
For that* Computers->properties->device manager->Display Adapters->graphics driver version u have install that...And after log off Run your "C:\\TC\\BIN\\TC.exe".it will open in full screen. As everyone knows TC is not supported full screen in windows 7 its too difficult to work in a small screen where i think no one can ever imagine writing a program here. For better full screen view you have to use a third party software called "DOS Box v0.74". Download and install DOS Box. How to run TC in full screen mode using DOS Box. 1.At first create a directory(Folder) in C drive and name it DOSBOSS so the path of the directory should be C:\DOSBOSS. 2.Copy your installed TC folder in DOSSBOSS folder. 3.Run DOSBox 0.74.exe from desktop or start>All programs>DOSBox0.74>DOSBox0.74.exe. 8.Now give the command start TC: type "tc" then press enter. your turbo c will being run on DOS Box in small window.now press "Alt+Enter" to make it full screen. and enjoy your Turbo C++ in full screen. 2)download and extract and install now a shortcut is created in desktop. You can haply run full screen of the Turbo c++ in Windows7. It takes several steps . first you need to known. Why windows 7 is not support for full screen of command prompt operations . In This is majorly interactive point of view the operating system are divided into two types. 1. CUL - character user interface supported operating systems. 2. GUI - Graphical user interface support operating system. This present world GUI is mostly interested to use the operating system. as the senario The Windows 7 Operating system is develop fully support for GUI. Windows 7 also support internal CUI , but not much familler with windows 7.
so Turbo C++ is the CUI related Application. So it is not support in windows 7 partially but if change some settings. This Turbo C++ is also can be used haply. * Right Click on My Computer Icon. * Chose and click on Manage. * select and go to Device manager ( you can directly type on start menu as device manager ). * Go to Display Adapters. * and go to Display Driver . * And Uninstall that Driver. * Lunch the Turbo C++ Now. * press Alt + Enter. * Your Turbo c++ is Coming as full screen. if you have not interested to uninstall you Display driver. then do this. * Open the Command prompt window by press in Win +r and type 'command' . * Click on top left corner a system menu will menu appear. * go to Font tab. * Increase the size of the font. If Windows 7 not support full screen . if you not intrested to do above methods. Then haply download C++ Programming related compailers are available. Download and install on your system. and after you no need to uninstall any thing no need setting any thing in your system. Dos box ( Which is An tool to runn CUI compilers). This site contain several compilers for C++ Programming. Yes in turbo c++ is not comes in the default to full screen is not work out because of to various functionality to various companies focus them..
Full screen is not a problem to working the your Program is easy to cover it..
--> In this cause to full screen as to focus them is uses the "DOSSBOSS" can create to work out to in the easy to process in the ul screen is coverd..
- Dos BoX is uses them to convert the Full screen..
as to use to full screen mode .. Such type of problems comes just because of the settings of Layout. You can easily make this according to your requirements. 1. Firstly, open you Turbo C++ and go to its properties. 2. From the properties, select Layout tab. A dialog box will appear on the screen. 3. Now, set the height and width you need. You can set this according to your screen resolution also. Manage that and you'll get the result. friend . you have problem with your Turbo c++. >> This is right that you can directly run trubo c in full screen mode in windows7. >> but you can do it with manually. >> just download " dosbox" software . >> after that run it and now you have to set the path of your turbo c file using command. >> like that any path you can set and now you can use this with full screen mode. >> i hope you have done it. 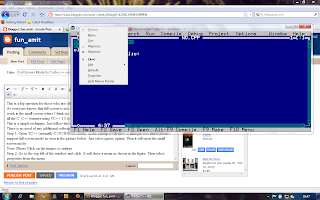 To work turbo C++ on windows 7 with full screen without MS-DOS support will be using the popular DOSBOX emulator, just download this http://www.megaleecher.net/sites/def...or_Windows.zip and install it after unzip.